I feel almost well versed with this topic as it’s one that completely resonates with me. While I was not the most unhealthy person on the planet I didn’t start off being a health food activist (for lack of a better word). I always cared about what I would consume but nowhere near as I do now. I know how difficult is it to lead a 100% healthy lifestyle, especially when the media and supermarket shelves entice us with lots of processed food. With a lack of discipline or curiosity, it’s so easy to go off the beaten path. My weakness tends to be during the time of month. I kid you not I am still learning how to curb those monthly cravings and I hope to share some tips and tricks with fellow females – some recipes and theory stuff to be precise. Food constitutes our survival without it we couldn’t survive, yet many of us have this horrid love hate relationship surrounding food. The things we care for the most are what’s bad for us and the things that promote good health are overshadowed for all manor of reasons. When our diets spiral out of control it’s easy to go from consuming one chocolate bar to eating two packet of crisps, a sausage and a diet coke to ease our guilty conscience. Once the self-control is gone, we totally disregard our previously good food habits in favour of more processed food with the middle finger salute to wholesome foods. 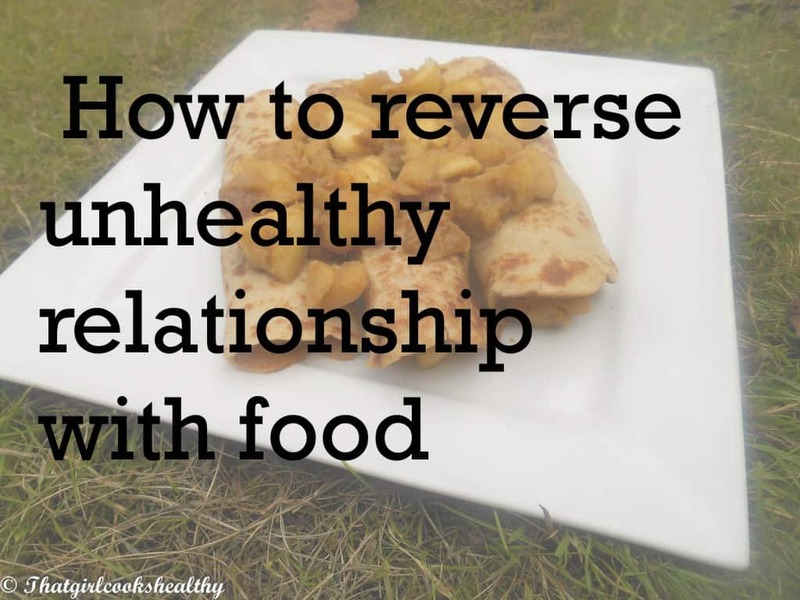 We know self-control is one of the key aspects of how to reverse the unhealthy relationship with food. Eating the right type of food helps to lose weight or maintain the ideal level of physical health. However, it’s crucial to find out why we succumb to these dreaded food habits. There are two types of cravings; physical and emotional eating and once we know the difference, it not only helps to put things into perspective but also helps to respond to these cravings differently. Emotional craving tends to be surrounded by eating impulsively, according to thoughts and feelings at any given time. For instance, if you’re feeling unhappy with a need to suppress this sadness, the immediate thoughts are turned to food that evoke happiness, like ice-cream or chocolate. If you haven’t already noticed the trend with comfort food, it’s usually highly processed with carbs that create a crash and burn stimuli. Physical cravings are physiological responding to the low sugar levels of an empty stomach (.i.e going out for day without prepared food) which can cause dizziness, fatigue and thirst. Once the differences become more apparent, responses can change from acting negative to more positive. I’ll share with you a real life account which happened a few months ago. I was out buying some groceries in the supermarket where I winded up conversing with a consumer. The subject was unrelated to health but we some how ended up discussing weight, she told me how she’d recently gone to Greece for a few months and during her stay managed to pile on 10lbs in a short space of time. The lady in question despised her appearance and desperately wanted to shed the extra pounds. Without being invasive I subtly give her some tips and offered support which thankfully she was quite receptive of. I quickly learnt from our conversation that she had zero knowledge of what wholesome food was and that it had attributed to this excessive weight gain. Firstly, all is not lost, so DON’T be so hard on yourself because help is at hand. We are human beings with flaws and face many challenges throughout our lives. Just like the lady at the supermarket, she didn’t know what was causing her weight gain but once she gained awareness she could start to re-examine her diet. Whether you’re a comfort eater or physical, unprepared eater, these tips will help to develop positive cohesion with food. Raise awareness – being aware of what we eat and why is a great place to start. Once we know why we either comfort or do it on a physical basis, lessens the chances of repeatedly doing the same thing over and over again. Change eating habits – easier said than done right? Yup I know the cycle of change isn’t easy but once you learn to explore more fruits and vegetables, a very slow change in food habits will lead to a more healthier lifestyle. Buy cookbooks or read blogs – If you don’t know where to begin or stuck with ideas of what to cook then investing in some cookbooks or browsing the web for cooking blogs is a good place to start. Positive affirmations – Don’t let that voice of doubt discourage you, tell yourself you can DO IT, be confident about this change. Limit purchasing junk food – I’m not going to recommend a rapid change of tossing out the junk food and substituting it with endless amounts of spinach and kale. However, cut down on buying junk food perhaps by half and purchase more wholesome foods. This will help to limit comfort eating or going on a mad dash for some processed goods within reach. Food journal – Create a food journal and log every snack and meal eaten, carry it everywhere Create an electronic version if you want to be discrete, it takes no more than five minutes to write an entry. I want you to document what you ate and how you felt at the time. This can help to identify any common bad eating habits, keep track, progress and reflect on the day’s events – don’t use it as a tool of guilt, it’s there as an aid to guide you, remember that. Learn to love fruit n veg – Wean yourself onto fruit n veggies, take baby steps – add more wholesome foods to your diet until you eventually give up the bad foods. Once people are committed to giving something up, they eventually kick the habit. More meals less snacking – Snacking on crisps, chocolate bars and cookies is one of the biggest reason why obesity is so prevalence. Cut down on the bad calories and try to eat some fruit, nuts and seeds instead. Learn about diet and nutrition – sometimes people eat so poorly not because they don’t care, it’s down to things like being ignorant of nutrients; where they come from and/or even the importance of them. Do some research on vitamins and minerals – the role and function and why we need to maintain good health. Be prepared – sometimes when we’re caught off guard we tend to eat something unexpectedly. That’s okay if this happens on the odd occasions but eventually we need to have enough self control to say “No” or seek healthy alternatives. Be realistic – Don’t be too hard on yourself, build up the changes mentioned above gradually because you’re more likely to fail if done too quickly. Remember to take baby steps, reach out for help if necessary but BELIEVE IN YOURSELF. Question, How you ever experienced a bad relationship with food? If so, how did you manage to remedy it? I’d love to engage with my readers. Learning about what was in my food was a big step forward for me. Yes, it certainly is a major relevation.